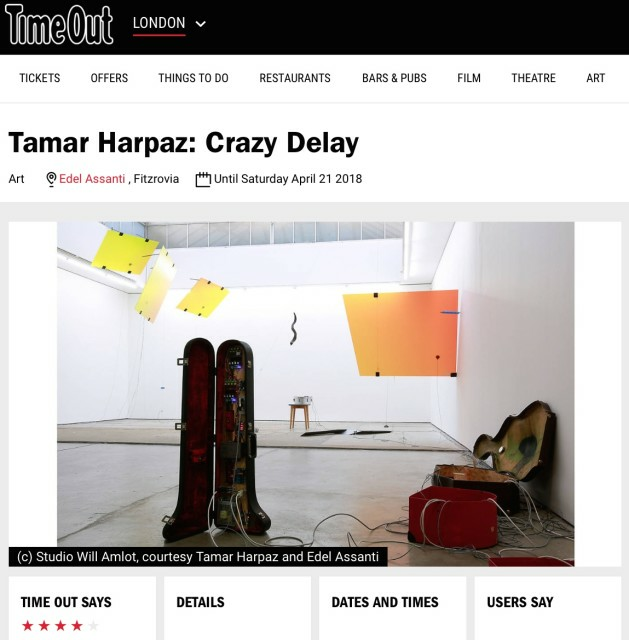 29 March 2018 Sheets of metal clang, huge panes of orange glass thrum, a drum thumps, cups and spoons clatter: Tamar Harpaz’s installation is a living, shuddering circuit of sound. The Israeli artist uses contact mics and mini speakers to make objects – and the gallery itself – twitch and hum. Her unborn son’s heartbeat pounds through a metal lightning bolt on the floor, voices and melodies are amplified through glass, a teacup emits speech from the ground. As all these bits come alive you slowly start pulling a narrative together. The orange and yellow glass panes are like Israel’s sunsets, the shofar hanging from the ceiling and the little tapping mezuzah are symbols of a home that’s far away, the voice calling through the space says ‘hello? Tamar, are you there?’ – the whole installation is basically sonic and visual homesickness. It’s the heartache of the outsider, the lonely isolation of the immigrant, brought to life. It’s longing for home and distance from your culture, and its clicks and clacks will tick through you long after you’ve left.